I'm really excited to share my news with you. I am Paper Sweeties' Guest Designer for May! 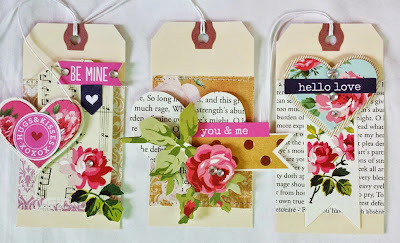 I recently got to play with an adorable stamp set called Stitched Tags. The tags are adorable. I decided that I wanted to make a little set of them. I also created a gift box to put them in. 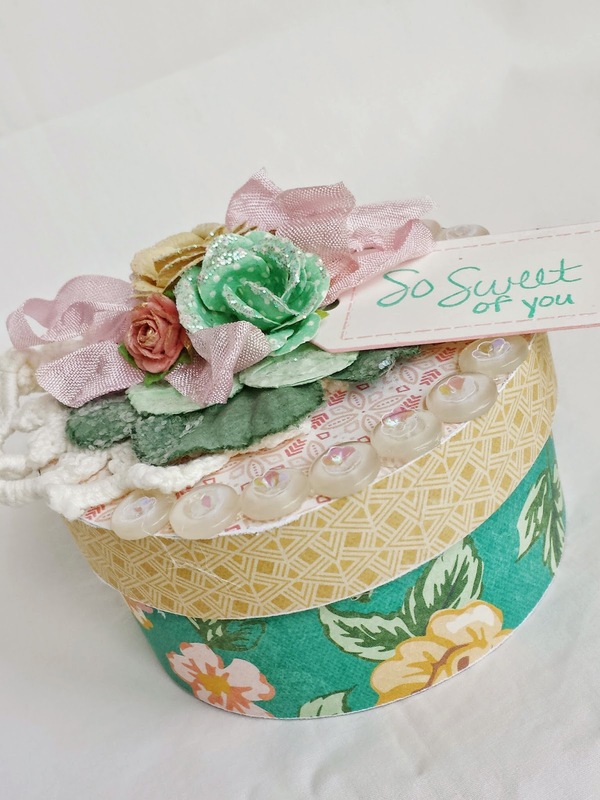 This would be the perfect hostess gift, or thank you gift. I used Crate Paper to cover the box. Then, I went to town detailing the lid. I started by adding a large Prima flower then added some smaller roses. I used some of the Bubble Gum seam binding to add a bow. I tucked one of the tags onto the top, as well. I wanted to add some mother of pearl buttons to the lid. I topped them off with marshmallow colored sequins. It adds the perfect amount of bling and goes perfectly with the chunky glitter on the flower. 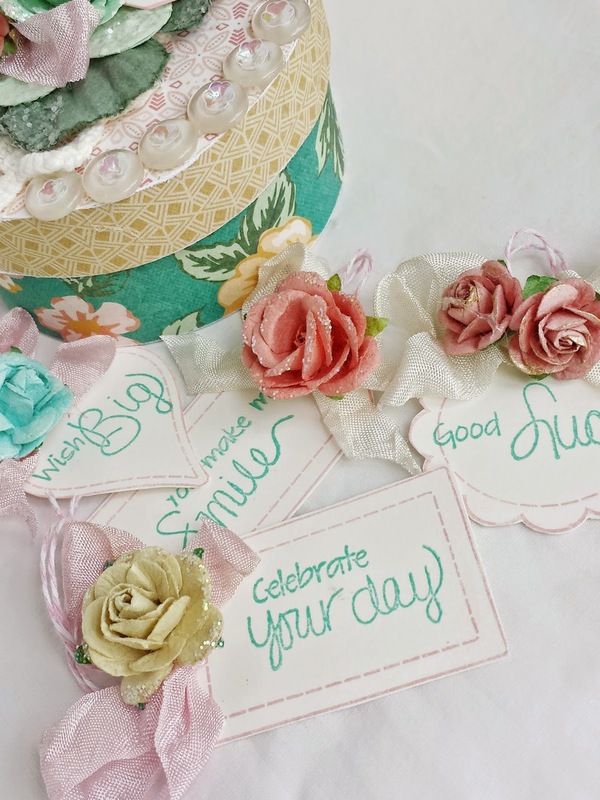 As for the tags, I stamped them in pink chalk ink then added the sentiment in teal. 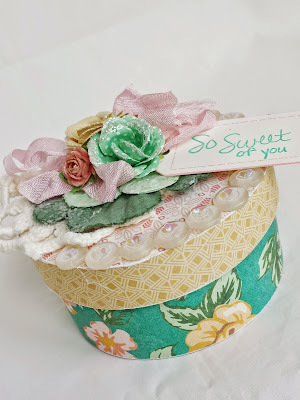 I tied more seam binding (Bubble Gum and Frosting colored), added some twine and topped each off with a flower or two. I think these will look great on little gift boxes! So, here's the whole thing. 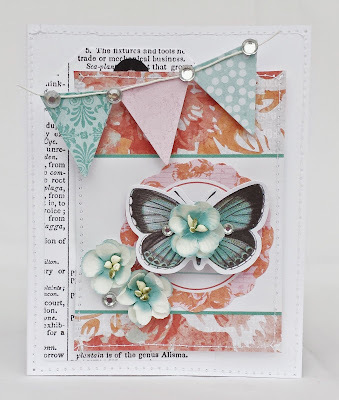 Soft, sweet and shabby! Paper Sweeties' stamps and embellishments were the perfect thing to pull this all together. Thanks for stopping by! It's that time of the month, again. I love our Gossamer Blue inspiration blog hop. Today, I have some brand new projects to share with you. 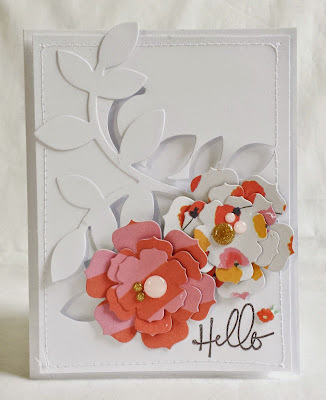 I decided that I wanted to use the cute paper flowers that came in the main kit to create some cards. 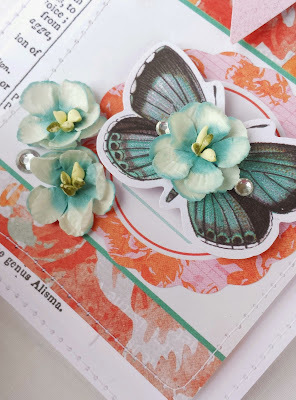 I also wanted to use some of the 3 by 4 cards from the Life's Pages kits. I selected three that I felt coordinated well and created from there. Here are the cards that I came up with. As you can see, I didn't have to add much to make them. 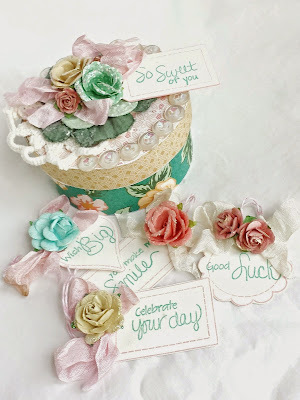 I did cut a small piece of doily and stitched it to the top of the cards. This provides some cohesion across all three. I wanted a bit of gold on each, so I used the little Crate Paper bits and pieces that came in the main kit. My next card uses the On My Desk collection. I love the bright colors and knew I wanted to have them pop against a white background. 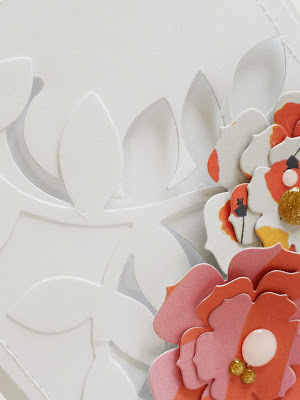 I cut the leaf from white cardstock and loved the negative space. 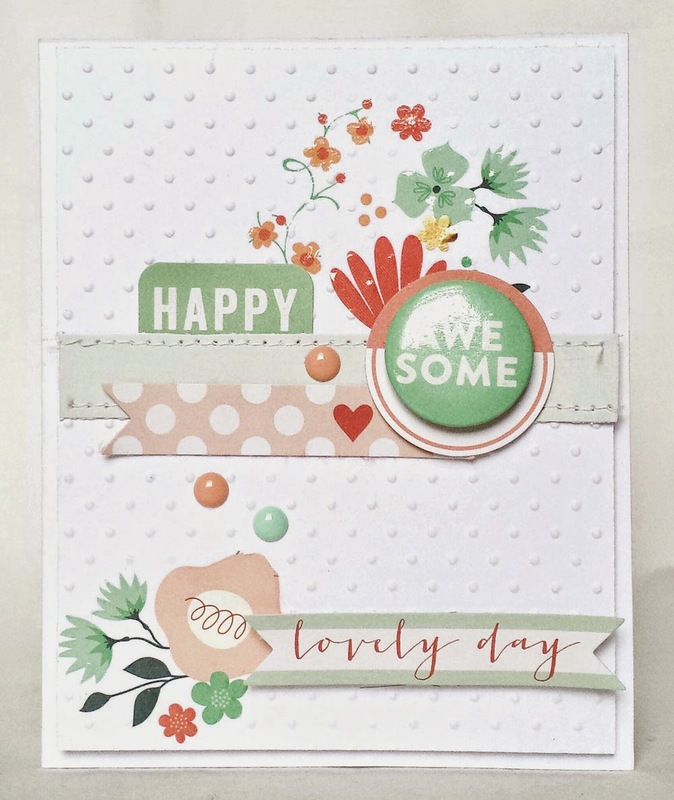 So, I made that the background and layered the die cut on top of it. The flowers were die cut and added to the bottom. 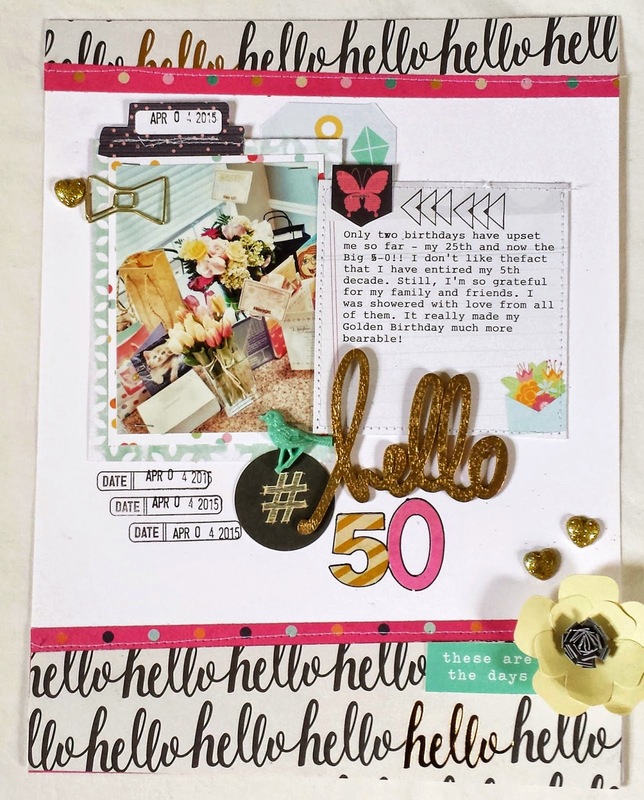 I finished off with the Hello stamp from the Life's Pages kit. So, that's it for today. Thanks so much for stopping by. Be sure to head over to the rest of the team's blogs for lots of inspiration. You'll be visiting the talented Beshka Kueser next! 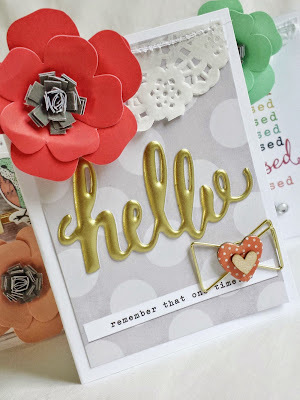 I was scrolling through my blog and noticed that I haven't posted many cards lately. So, I thought that I'd share a few that I've made lately. 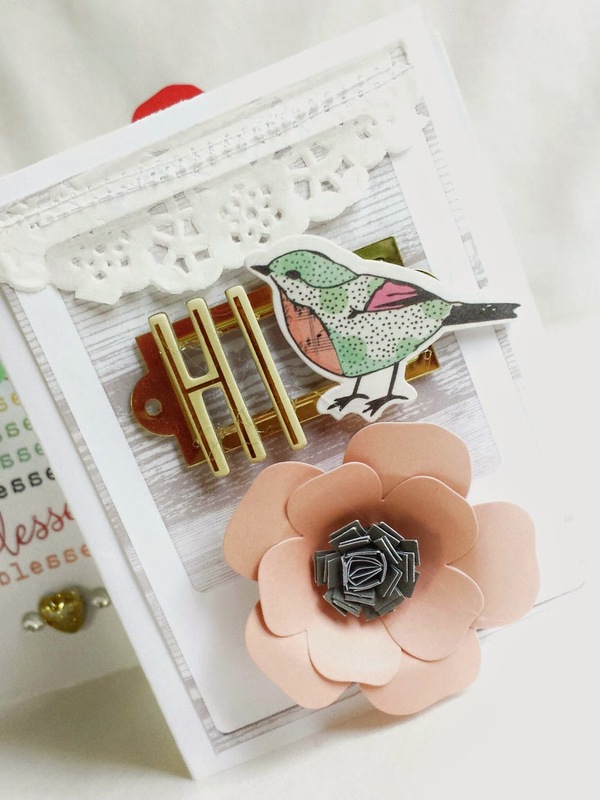 This first card uses lots of goodies from Kaisercraft. I also added some little Petaloo flowers. This one uses goodies from My Mind's Eye. I am so glad that rubons are making a come back. 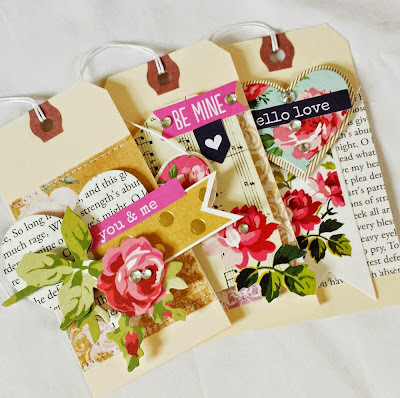 I added these after I embossed, but you can apply them before, as well. These tags are some of my favorites lately. 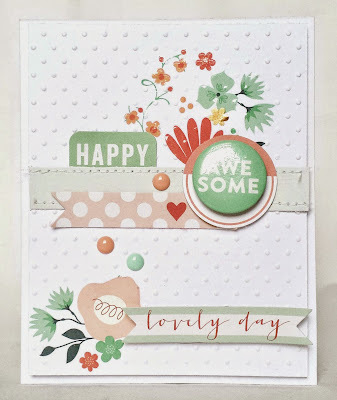 I used a line by Anna Griffin and added some Pink Paislee stickers, too. I love the mix of colors. Hi All! 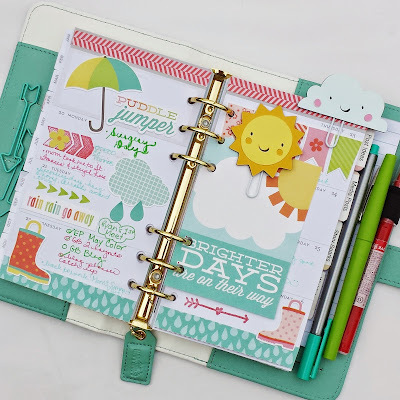 Catching up with some April planner posts today. Thanks for stopping by! First up is my completed April calendar. I only recently started decorating these and it's a lot of fun. I start off by adding some washi and a few stickers. 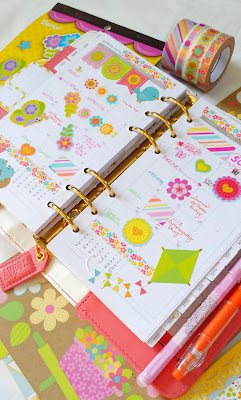 As the month progresses, I fill in my unused spaces with more. I love how it turned out - so bright and cheery. 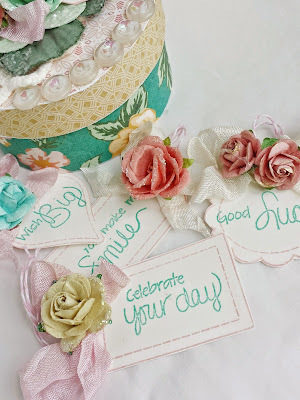 This next spread uses some goodies from Echo Park paper. I added the stickers and card from their line. The cute clips are from Kawaii Paperie. 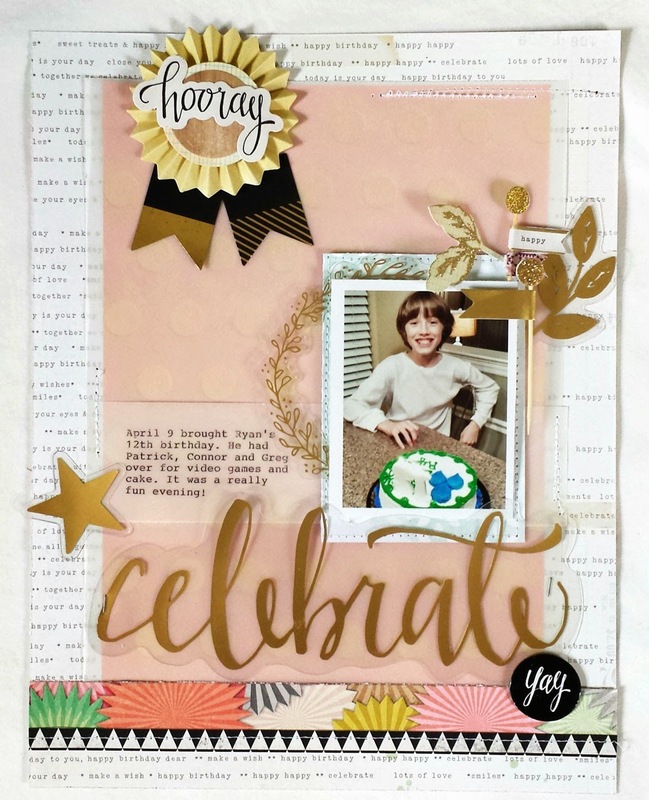 Here is a spread in my Gold Color Crush.. The stickers and card are from Crate Paper. I made the bow clips using Heidi Swapp bow stickers and the heart is a resin piece from Webster's Pages. I just glued them to the clips. 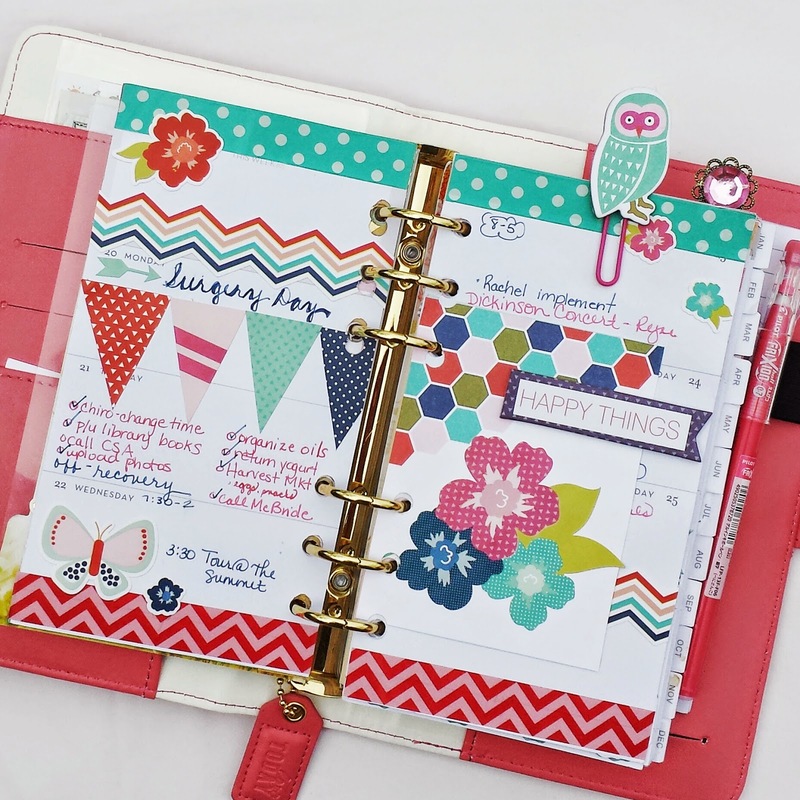 I used another Echo Park collection on this page, Isn't that owl adorable? He was a piece of chipboard and I glued him to the clip. 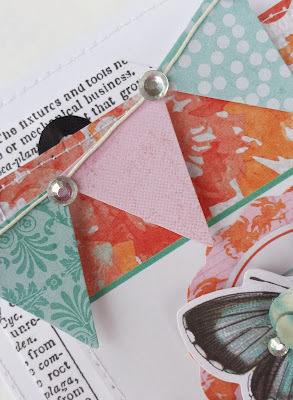 I love adding banners to my pages. Next up is a springy spread that I created. I started of with washi from Michaels, then I added stickers from Doodlebug. I love the color combo on this one. 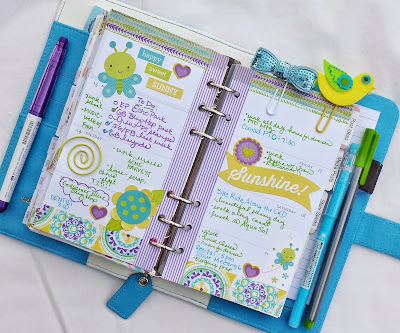 I've been loving my Color Crush planners. I know some of you may still be looking for one. Check out the Webster's Pages Store Locator to find out where they might be in stock. Happy May! So glad that the warmer weather seems to finally be arriving. Woo hoo. I wore flip flops for the first time the other day, so that means that my happy time is finally arriving. Gossamer Blue's May Kits are live And if you love Crate Paper, you'll love them. I was so excited for this month. 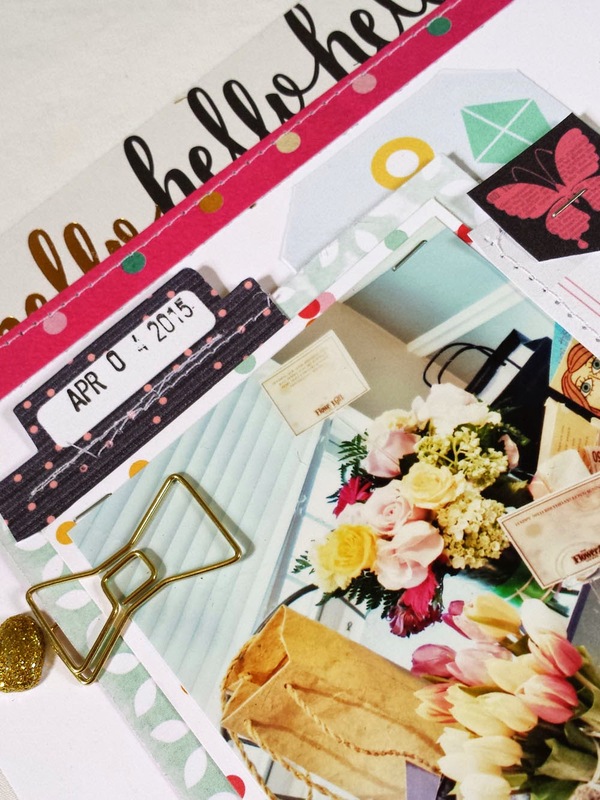 I decided to switch over to the Scrapbook Team so that I could do layouts for each month's gallery. My Project Life is sadly lacking and I am thinking of taking it in a new directions. So, working on layouts for GB is really exciting for me. Here are the two pages I created. 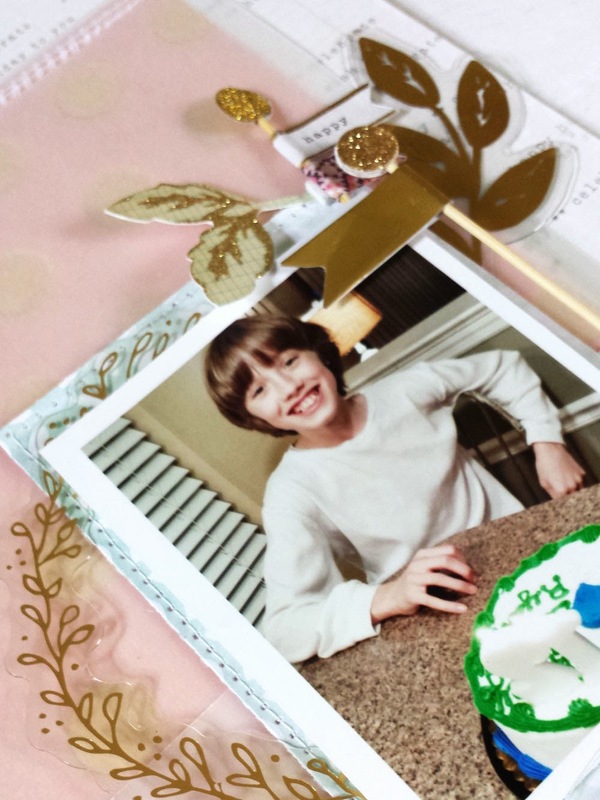 This first one documents Ryan's 12th birthday. I used lots of Crate on here. 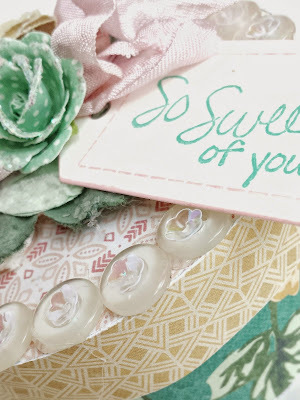 I love the big vellum words that came in the die cut pack, so I decided to use it as my title. There were lots of pretty gold elements, so I used them behind my photo, letting them peek out a bit. 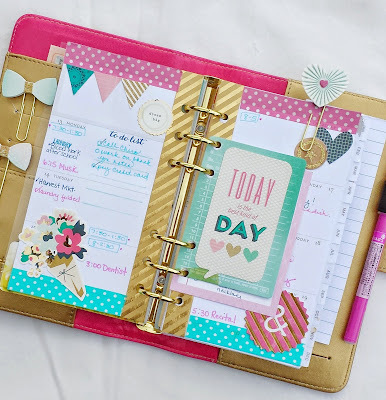 I placed vellum over the pink and gold polka dot paper. It softened it a bit, but let the gold peek through. 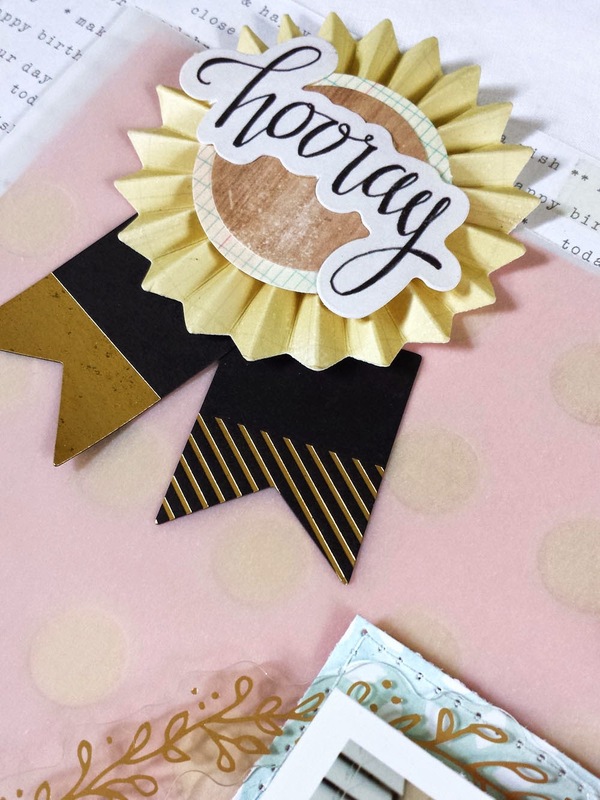 I made the ribbon here by adding a couple of banner stickers to the rosette. We had two birthdays in our house this past April. The big 5-0 arrived for me. (Ugh) I really was showered with love, though, so it was a nice day. The picture on here is of my beautiful flowers, cards, and gifts. 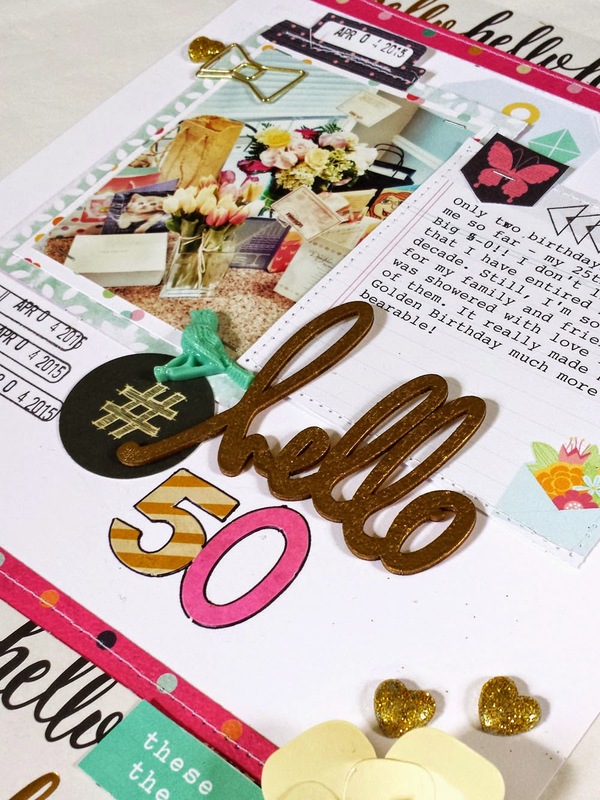 I used gold embossing powder on the wood 'hello' piece. I love it looks. Somehow, gold is just never captured very well in photos. There were so many cute elements in the kit. I especially love the little bow clips and the glittery hearts. 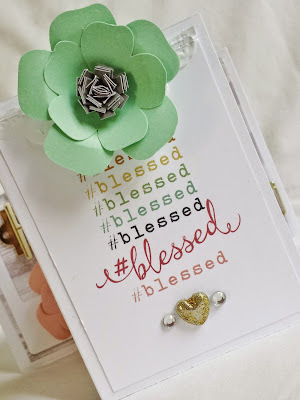 So, head on over to Gossamer Blue and check out what's new. Don't forget to stop by the gallery to see what our talented team created!